Throughout the last few years, New Haven Farm has rapidly changed into a modern quality service driven organisation providing person centred support to people living with a disability. 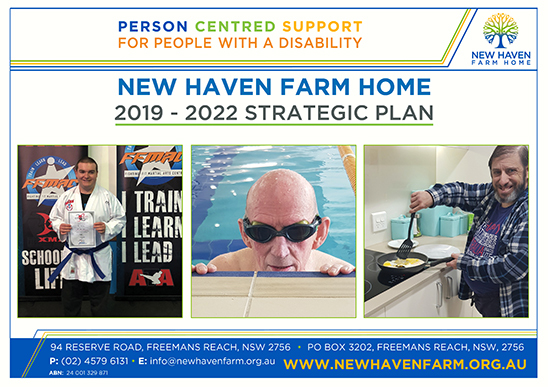 For our organisation to continue to be responsive to the needs of people living with a disability and their families, New Haven Farm Home has developed our 2019 – 2022 Strategic Plan which will provide the necessary guidance in our growth and development as we work towards our vision. Click here to download our 2019-2022 Strategic Plan. Board and Management has looked at and strategically evaluated our role in supporting more people living with a disability to be valued members of our community, including that of community needs and the NDIS. Our Strategic Plan will provide a framework in which we believe our service will grow and develop, and we will be able to further enhance the quality of support service to both our current and future clients.